I just ate a hard-boiled egg. I ran out of time to post something substantial tonight. I played two hours of Godfather on the Wii. It’s easily one of the top five games for that platform right now. There’s a certain satisfaction to playing a mobster, taking him from a lowly street thug to potentially the Don of NYC. From extorting shopkeepers to taking out rival mobster families, it’s all good stuff. The unique Wii controls are used extensively throughout the game, especially when it comes to hand-to-hand combat. From the trailer above, you can see it there’s some fun to be had. I have little time for posting tonight but I will mention what I’ve been listening to at work lately. It’s called Pandora, a music web site unlike anything that’s out there right now. You could classify it as Internet radio but that wouldn’t do it justice. Pandora streams high quality music to you and only music that you want. Enter a song you’d like to hear and it’ll try to find you that song and… more songs like it. You can do the same for artists. Give it a try. Tonight, I was able to setup my new 5.1 speaker system. I’ve owned two previous 5.1 systems before, the first coming in about 70W RMS and the last about 90W RMS. My new system outputs 100W RMS per channel for a total of 600W RMS. Yes, this is most powerful accoustical device I have ever owned. It was very unfortunate it was kinda late by the time I set everything up. I really wanted to take her out for a test drive but I was limited to a very short sampling of a scene from The Island (a totally underrated movie if you ask me), a few minutes of Gears of War, and a couple climatic moments from Revenge of the Sith. Oh, how sweet it was. I have forgotten how rich surround sound is. It was a feast for the ears. I want to replay every Xbox 360 game again. I want to rewatch every DVD I’ve bought in the last three years. I cannot wait for the weekend. Yeah sure, I’ll probably be working but when I get home… oh, how the sounds of joy (and/or explosions and bullets) will fill stately Wayne Manor. Like a lot of pro athletes, NFL quarterback Peyton Manning spends some of his time doing charitable work. As this United Way commercial shows, however, Manning puts a lot more heart and dedication into it. I was out for a Sunday drive in the vicinity of Coquitlam Centre when I saw something that nearly made me drop my Super Big Gulp. For about two years, there’s been an empty restaurant space where a failed Popeye’s Chicken used to be. Today, on the roof of the building a sign proclaimed what future tenants would be taking over. Coming soon is a combined KFC and Taco Bell outlet! KFCs are plentiful in BC but free-standing Taco Bells are a rarity. For some reason, they’ve only opened them up in Surrey and Maple Ridge. Now, I’ll be able to get the awesome taste of Taco Bell only ten minutes away from my home. Oh yummy steak gorditas! I don’t really have anything to say here but I do know people like to see baby animals. If this means you return to my blog just one extra time, then I’ll be happy. 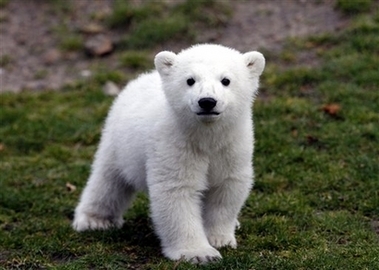 More pics of Knut here. Let’s take a moment to talk about nocturnal leg cramps. Do you get these? If you don’t, count yourself lucky. I get them once in a while. I had it happen to me last night. I was half-asleep. My left leg was bent across my right one. I remember thinking, “Oh hey, my calf muscle is contracting, I hope that doesn’t cause… oh crap.” The calf muscle then attempted to contract itself through my knee cap. I went from being blissfully half-asleep to feeling a pain I would register a nine on a ten scale in a matter of a second. I could only grip my now rock hard calf muscle, hoping it would stop contracting. Meanwhile, it felt like a nuclear explosion had gone off inside my leg. I could only breathe in short, sharp puffs as I gritted my teeth. I don’t know how long it lasted, it seemed like ten seconds or maybe it was as long as thirty. The muscle then suddenly relaxed and it was all over. As I laid there on my Thundercats sheets, I found myself completely awake and now my calf was extremely sore. After some indeterminate time later, I fell asleep again. They (and I mean doctors) say night time leg cramps are caused by dehydration and too little potassium in the system. I think I was kinda thirsty all night, so it that was most likely the cause. Thank you for reading a post about a part of my body getting rock hard at night. I’m too tired to post anything coherent tonight, so I’ll juts stream some consciousness onto the keyboard. I gotta a craving for crunchy foods at this exact moment. I want something like kettle chips right now. A really satisfying crunch. It’s too bad nothing in the house even comes to close being crunchy in texture. I got a bag of Mexican microwave popcorn but I don’t want to go through the hassle. You know what I’m eating instead? A muffin… from T&T Supermarket. I’m not sure if they make their own muffins or buy from a wholesaler. The muffin came from a box of assorted muffins. Out of the three kinds in the box, two kinds have raisins in them. I hate raisins. Who the hell puts that many raisins into a muffin? Why am I even eating this muffin? Almonds. I would like crunchy almonds right now… or a macadamia nut… surrounded my milk chocolate. Ok, it’s time for bed. I hate raisins. Actually, I’m not giving away an Xbox 360. I am, however, giving away my copy of Project Gotham Racing 3 and a trial membership for Xbox Live Gold. I don’t play PGR3 very much since I don’t enjoy accurate race sims. It is supposed to be one of the best driving games out there, I’m just more of Burnout type of guy. Be the first to send me an e-mail and the game and the trial membership card is yours (via the postal service). Please note, I have the NTSC version of PGR3, so it won’t do you any good if you’re from another region.